Domain of Maritime is considered to be the backbone of any maritime nation. It has a huge impact on building and strengthening the economy of any nation. This was stated by Vice Admiral ® Rao Iftikhar Ahmed HI ( M), at a seminar on Maritime Security hosted by the Department of Defence and Strategic Studies, on Monday April 1st 2019. 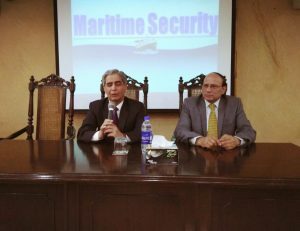 The guest speaker, who has held important positions during his distinguished career such as deputy chief of naval staff (operations) at the naval headquarters, as well as managing director of Karachi Shipyard and Engineering Works, was extended a welcome by the chair, Dr. Nasrullah Mirza who gave a brief introduction to the department and thanked Admiral Rao for his visit. 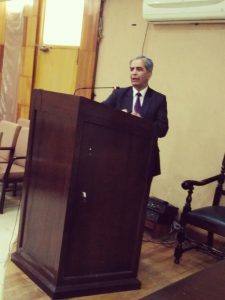 During his lecture, the speaker highlighted that the maritime sector is one of the most neglected area of our nation which needs to talk about as a priority. 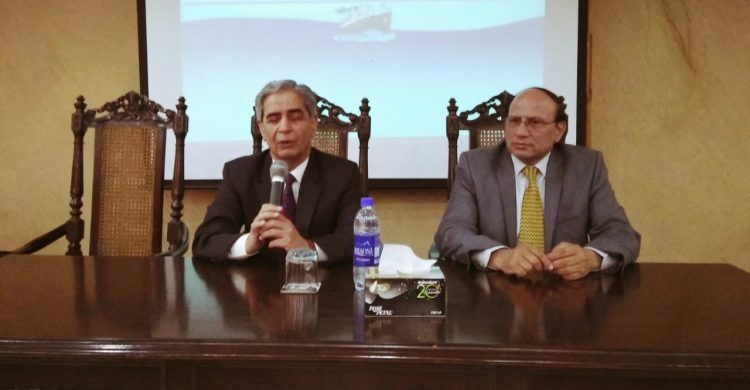 Discussing the various aspects of maritime affairs including security, diplomacy, economy and trade, he said that Pakistan can earn billions of dollars through trade and connectivity with the global powers by developing favorable policies. After the inception of CPEC significance of this sector has increased manifolds. He further stated that trade through the sea is one of the cheapest and most effective ways, and helps boast the country’s economic and trade potential. He also covered in great detail, the various traditional and non-traditional security concerns, such as trafficking, piracy, the politics of Indian Ocean Rim Association, Pakistan’s joining of regional to international maritime alliances, such as CTF 150 & 151 and the changing dynamics. During the Q/A session the worthy guest answered the queries of the participants and appreciated the interest of the researchers and scholars in maritime affairs.